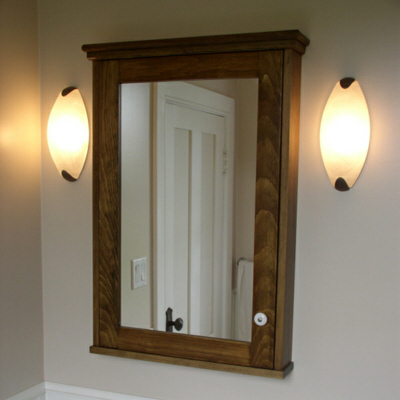 Stonehaven Medicine Cabinet - Woodworking Plans! This 21"w x 30"h x 3 1/2"d pine medicine cabinet was designed to match our antique washstand vanity (#SCP – 1201) but would look right at home in almost any bathroom decor. It features a frameless-style natural-finish birch cabinet with 1/2” plywood shelves and European-style hidden hinges. This basic cabinet is wrapped with a stained pine exterior including mirror door, side and bottom panels, and custom crown top moulding. The cabinet can be partially recessed into a suitable wall cavity, simply by adjusting the width of the exterior panels and crown return. Plans for the matching Washstand Vanty(#SCP-1201) are also available. — all in an 18-page printable PDF file that you won't find anywhere else. These woodworking plans are suitable for any DIY'er with intermediate skills and typical woodworking shop tools.